Docomo advertises the Xperia A as costing ¥78,120. While this is in fact the price set by Docomo, the actual total cost varies by ¥3,000 to ¥4,000 between various Docomo shops. On top of this, the full price is often not actually shown on the displays. 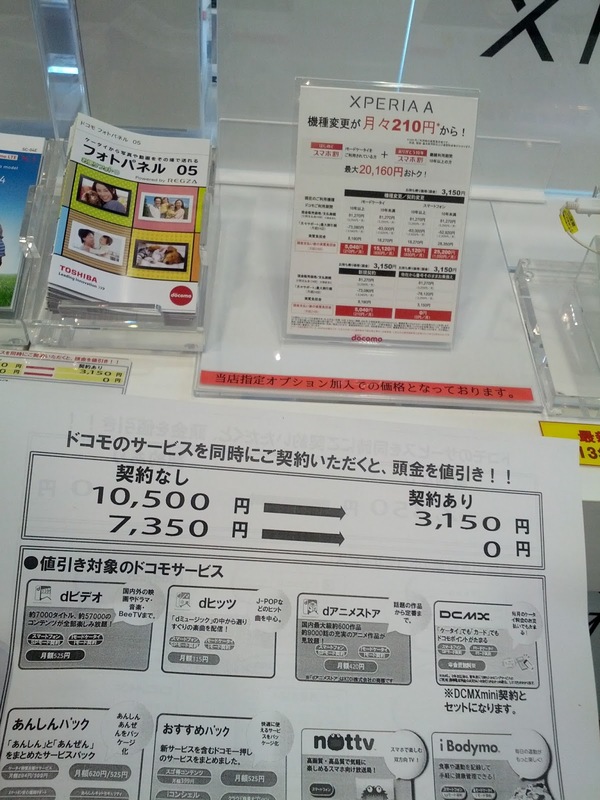 I recently visited three different Docomo shops to compare differences in price. Indicate the cost of the down payment (atama-kin 頭金). Explain that the displayed total price requires signing up for "add-on" services. The price displayed is when adding the specified options. And, at the top the cost of the down payment is shown is (¥3,150 reduced from ¥10,500). This is where the variations between shops arise. 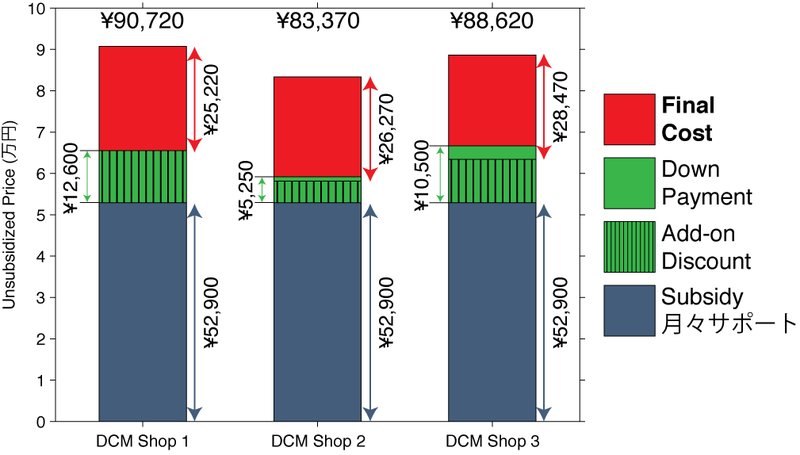 Some shops are lowering the downpayment to zero, others to about ¥1,000. The down payment is the shop's revenue. 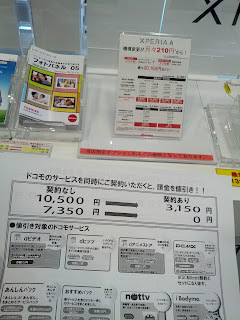 The shops are also receiving money from Docomo for getting people to sign up for the option services. Of course the option services are totally unnecessary and would cost you a lot of money each month, but because there is no early termination fee, they can be immediately cancelled. Most are also free for the first month. In total, signing up and immediately canceling would cost about ¥800. The graph below shows the variations between the three shops. Yes, ¥90,000 for a phone is just stupid. If you shop around, you can get this phone for about a total of ¥25,000 which is much more reasonable. The graph doesn't include the approximate ¥800 cost of the option services. HOWEVER, you cannot just pay ¥25,000 up front in be done with it. The cost after subsidy must be paid in installments. You either pay the full price upfront and get the subsidy as a discount off your bill every month, or you pay about ¥1,000 each month for the phone. Those are the only options. Why would Docomo want to essentially give interest free loans? Simply to condition people to pay a certain amount on their bill each month. So if I understand correctly, applying for these optional services and paying for the phone monthly can greatly reduce the inflated phone price? Would this also work if you bought the phone and had them unlock it that day? Yes, but you have to remember to cancel the services before the start of the next month, or you'll quickly pay more in unneeded services. Docomo doesn't care if you unlock the phone (they charge ¥3000+tax). You will still get your subsidy. But if you cancel your contract outright, or just the data plan, you will cease to get the subsidy. Ah, I see. So I'd have to go through them for my data plan still instead of being able to use a MVNO then? If you want a subsidy, then yes. Otherwise buy an unlocked, full price phone from overseas. It'll be expensive but as inflated in price as a docomo phone. Thanks! I was only considering buying an unlocked phone here at Docomo because, as far as I understand, I won't have access to "true" 4G if the phone is unlocked and from overseas? My plan was just to get a phone at Docomo, unlocked, without a contract, and go with a MVNO, but the whole process is still new to me. LTE bands are scattered around the world, and so far there are no phones that you can get from overseas that will work with Docomo's LTE. The iPhone should but there appear to be software issues preventing it from working as well as it should. So the only way to get reliable LTE service from Docomo is to use a Docomo branded phone, and the only way to get that without a contract is pay a LOT of money. Also, unless you root your Docomo phone, you will be unable to use tethering with any MVNO. Thanks for all the information. I really appreciate it! You've been extremely helpful, as has this site.